The point is, I hunt with my husband, David and my two boys Warren and Easton. I started doing this over twenty years ago when David and I started to date. It was important to me to be interested in what he was doing and to be a part of it. Even though I grew up around hunting, I rarely, if ever, got to go because I was a girl. In that day and age, girls didn’t hunt. But I loved to be out in the wilderness and exploring nature. To me it was peaceful and has always been a place I feel close to my creator. So this was a large learning curve for me to be out with David. What do I wear? Where do I go to the bathroom? What do I use for a bow? Can I just use his or what? Can I wear my make-up or will it have a scent to it that will alarm the animals that a human is near? What about the treestand? Do I have to stand on that tiny platform while the wind is blowing the trees from side to side, not to mention I’m afraid of heights? How will I shoot my bow if I’m holding on to the tree so hard my knuckles are white. All of these things were running through my mind and had me quite anxious as a new hunter. 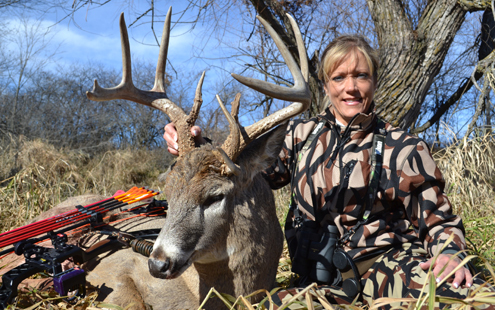 Author with her trophy buck. Excitement, however and the desire to be outside and to start to experience wildlife up close and personal pushed all that anxiety to the side. I will never forget one of my first experiences with deer was when a doe and her fawn laid down under my tree stand. As the doe relaxed in the warm sun, her eyelids got heavy and her eye lashes were so long they laid on her cheeks. She never knew I was there and I got to witness nature in one of its purest forms. My point with this story is everyone has to start somewhere. Being a hunter has nothing to do with how a woman or a man looks on the outside but everything to do with what is inside. A hunter or huntress, as I hear more and more often, is someone who respects wildlife. Someone who believes in conservation. Someone who wants to share experiences and the journey with their loved ones. Someone who wants to push their own limitations physically and mentally. Someone who is patient and understands they aren’t in control of every situation. Life and wild-life can take unexpected turns and as a huntress or hunter you need to be ready for them. As for equipment, the hunting industry has come far in the past 20 years. There is a better selection of bows, arrows, guns and clothing now than ever before. In addition, there are more than enough resources of other hunters willing to share their knowledge. More women are hunting every year as they are gaining the knowledge, experience, equipment and confidence in the sport. This is a movement that is powerful and important. It brings you close to your family and close to nature in a way that is beautiful. Give it a shot, you may find this is right for you.